Last year, without public knowledge or input, New York legislators were successfully lobbied by private organizations to use Medicaid money to fund fluoridation schemes and to enact a new law taking power from local legislators and their constituents to stop fluoridation. That power was placed in the hands of pro-fluoridation bureaucrats/activists which is stated to be a blueprint for the nation. The science upon which that decision was made is fatally flawed as described below. 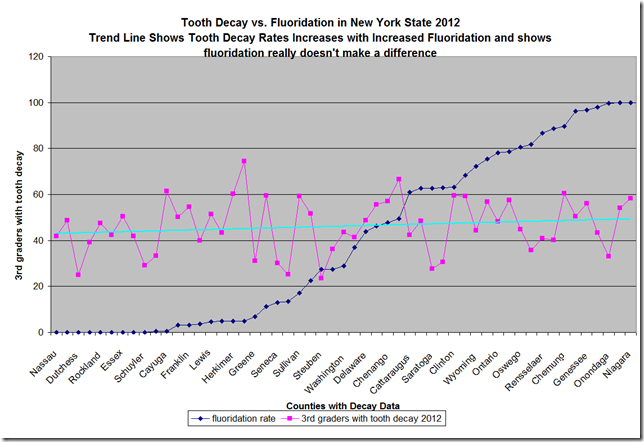 NYS Department of Health statistics actually prove fluoridation has failed New Yorkers, especially poor NY children. Also, ignored is a 1990 NYS Department of Health report alerting bureaucrats about fluoride's potential harm to kidney patients, diabetics and the fluoride hypersensitive even at optimal levels. However, this statement is based on one reference - a flawed study (Kumar et al., “Geographic Variation in Medicaid Claims for Dental Procedures in New York State: Role of Fluoridation under Contemporary Conditions,” Public Health Reports Sept-Oct 2010). Kumar uses Medicaid data but fails to explain that most NYS dentists refuse to treat Medicaid patients. Low-income New Yorkers in extreme dental pain seek urgent care in hospital emergency rooms where their infection isn’t classified as “dental.” So these cases don’t show up in Kumar’s calculations. Further, DrBicuspid.com reports that "Some 23 New York state general dentists and six orthodontists received $13.2 million in Medicaid payments in 2012 for services that appeared unnecessary or may not have been performed at all, according to a new report by federal health investigators." This type of information is not included in Kumar's calculations. In another paper published in the Journal of the American Dental Association (Jan 2012) , Kumar et al, reports that [despite NYS’s 72% fluoridation rate] emergency treatment for NYS toddlers' severe tooth decay has grown substantially in numbers and costs; many toddlers required general anesthesia. The reason: “There is a limited number of dentists willing to treat patients younger than 6 and/or accept Medicaid," admits Kumar, et al. Another Kumar study published in the Journal of Public Health Dentistry (Winter 2003) reports that severe tooth decay was responsible for two thirds of hospital visits by children under six in New York State. 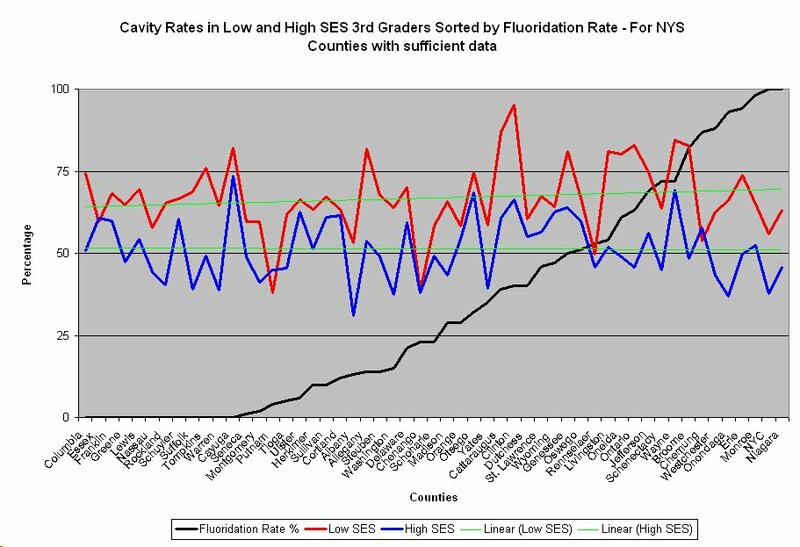 Also, In New York City, 100% fluoridated since 1965, more children required cavity-related hospitalizations, proportionately, than two of New York State's largest non-fluoridated counties, Suffolk and Nassau (Long island) whether payment was made by Medicaid or privately. The above chart shows no relationship between fluoridation and less tooth decay; but NYS 3rd-graders cavities are related to consumption of sugar sweetened beverages (SSB), according to Kumar et al. (“Sugar Sweetened Beverage (SSB) Consumption and Caries Experience.” (page 61 of abstracts presented at the 2014 National Oral Health Conference). They concluded that. Future interventions need to focus on educating parents and children on negative oral health effect of SSB. 2) The MRT companion document says “Systematic reviews of the scientific evidence have concluded that community water fluoridation is effective in decreasing dental caries prevalence and severity.” Three citations are used to support this claim - (a,b,c below) but they fail to prove fluoridation effectiveness. Excerpts: “We are concerned about the continuing misinterpretations of the evidence and think it is important that decision makers are aware of what the review really found. As such, we urge interested parties to read the review conclusions in full.We were unable to discover any reliable good-quality evidence in the fluoridation literature world-wide. “The evidence about reducing inequalities in dental health was of poor quality, contradictory and unreliable. U.S. Community Preventive Services Task Force’s Fluoridation Recommendation. The Task Force also admitted it couldn’t evaluate how race, ethnicity and total fluoride intake influenced fluoridation effectiveness because of limited data. “Few studies provided data on socioeconomic status, and most studies had measurement issues; many didn’t blind examiners and there was a lack of consistency among indices used to measure caries." “Included studies provided limited data on other sources of fluoride or race or ethnicity. Thus, the extent to which these factors influenced the effectiveness of CWF could not be evaluated…[and] there was not enough evidence to clearly determine the effects of community water fluoridation on health disparities between groups. “Quality issues across studies included failure to measure or acknowledge relevant factors such as the contribution of fluoride from other sources or access to dental care. Most of the studies also had measurement issues; many did not blind the examiners, and across studies there was a lack of consistency among indices used to measure caries and fluorosis,” they write. 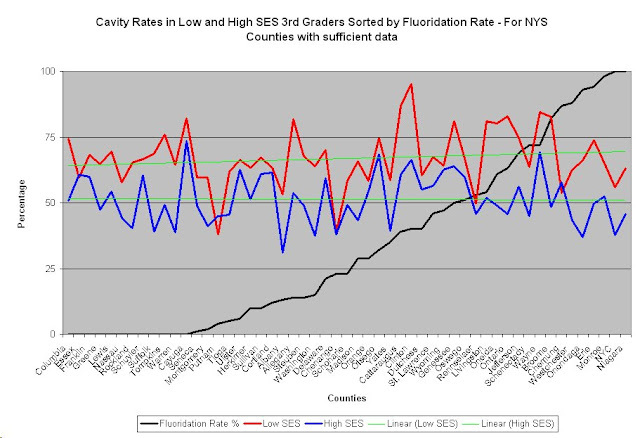 In fact, when NYS Dept of Health dentist J Kumar published a study to show that fluorosed teeth had less tooth decay, he included national data that shows that, as fluoridation rates increase, fluorosis rates go up but that decay rates stay the same. Here’s a graph of those findings. Besides the limitations of the references described above, more evidence points to the lack of valid data showing fluoridation is safe or effective. --- After reviewing all available fluoridation studies, the independent and trusted UK-based Cochrane group of researchers reported in 2015, that they could not find any quality evidence to prove fluoridation changes the “existing differences in tooth decay across socioeconomic groups.” Neither could they find valid evidence that fluoride reduces adults’ cavity rates nor that fluoridation cessation increases tooth decay. -- A 1990 NYS Department of Health report alerted bureaucrats that fluoride can potentially harm kidney patients, diabetics and the fluoride hypersensitive even at optimal levels. But it is ignored. -- A 1988 report "A Study of Fluoride Intake in New York State Residents," by Featherstone reveals that NYC 6-month-olds consume unsafe levels (0.4 milligrams daily from food and beverages). 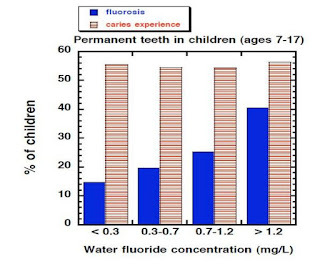 To avoid moderate dental fluorosis (yellow teeth) the Institute of Medicine (1997) recommends 6-month-olds and younger consume only 0.01 milligrams fluoride daily from all sources. -- Hidden fluoride in baby foods can also mar babies’ teeth, also, according to General Dentistry and Infant juices, too. 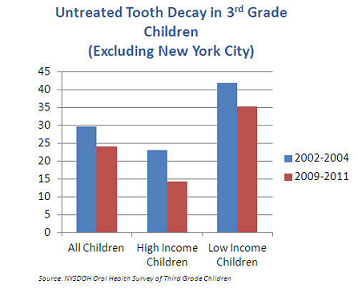 by reporting that fluorosis is more prevalent in NY’s African American Children. African Americans also have higher rates of tooth decay. The US National Toxicology Program (NTP) is reviewing hundreds of studies linking fluoride to adverse brain effects. The report won't be finalized until 2018 and may signal an end to the fluoridation program nation-wide. At least 314 studies investigated fluoride’s effects on the brain and nervous system. This includes 181 animal studies, 112 human studies, and 21 cell studies. Fifty studies link fluoride to children’s lower IQ. The majority of these studies were published after the 2006 National Research Council’s fluoride toxicology report concluded, "It is apparent that fluorides have the ability to interfere with the functions of the brain." Fluoride is not a nutrient or essential for healthy teeth – meaning consuming a fluoride-free diet does not cause cavities. Fluoride is a drug with side effects which shouldn’t be funded by Medicaid, prescribed by a legislator, delivered by water engineer, and dosed based on thirst and not age, weight, health without monitoring for side effects and overdose symptoms. **Dental Therapists need just two years training to do simple dentistry. Other developed countries have successfully employed DTs for decades. Rural Alaska and Minnesota legalized DTs, other states are trying. No New Yorker is, or ever was, fluoride-deficient. Many are “dentist-deficient” for many reasons which floods our Emergency rooms with dental patients in severe pain costing taxpayers often ten times the amount of a simple filling – wiping out any projected “cost savings” of fluoridation. Dental therapy practice patterns in Minnesota: a baseline study.